Ruger is releasing a new semi-automatic pistol caliber carbine. Interestingly, along with Ruger SR series magazines, it will be able to take Glock magazines. That is ballsy on their part, I like the moxie. People are always asking what pistol is going to be the "Glock Slayer." I personally think the answer is things like this. Make Glock's accessories (cheap and ubiquitous) accessories for other pistols and carbines. That will cut into their market share. I for one would be far more interested in other platforms if my investment in magazines would still be worth something. I am very interested in this gun. Ruger is the only firearms company that is really innovating. I enjoy seeing the innovation coming out of Ruger these past few years. They had gotten too bogged down with their traditional successes. Not sure I need/want a pistol caliber carbine, but they sound like fun. Interesting this version will use widely available 10/22 trigger components, and a variety of Ruger as well as Glock mags. I've heard it is a bit heavy, but hopefully Magpul or someone will come out with a lightweight stock (folder?). An adjustable or collapsible stock (ala M4) would make it much more friendly for youth and smaller women. I hope Ruger sells a million of them. That’s got California written all over it. Please do it in .40S&W, too! How so? Isn't the removable mag an issue in California? I thought the new regs made mags an issue even without a pistol grip. If they are legal, then yeah, could be an excellent home defense carbine for CA. Kind of a bold statement isnt it? The various pistol red dot companies are not innovating? Remington's mag fed 870s. SIGs 320s, their in house optic and the possibility of the first from the company optic equipped pistol? The shockwave style shotgun, the SIG Brace ARs gutting the SBR prohibition. The Maxim 9 integrally surpressed pistol? .224 Valkyrie? Glock gen 5s being damn near match grade barrel accurate out of the box whike maintaining glock reliability? I would also point out that while the Glock mag thing is new, this isn't even Ruger's first pistol caliber semi-auto carbine. They produced the police carbine from 1996-2006. No, 10 rd removable mags are legal in rifles without pistol grips. Ruger Mini, M1A, KelTec SU, and the original Ruger PC are all quite legal. AR rifles are selling like crazy with these weird kydex paddles that disable the pistol grip functionality, too. The only feature that would need to be removed on this new Ruger is the threaded barrel. USPSA and IDPA have options for pistol caliber carbines and this is way cheaper than a pistol caliber dedicated AR. The Glock mag capability is a nod to inevitability of consumer desire (will it take 33 rounders reliably?). It will also take the mags of the SR and new Security 9 series pistols. This might give some springboard for ruger into SSP (IDPA) and Producton Division (USPSA). The ability to get into some of the AWB states seems a far sighted move as well. I almost snagged a used one in .40 a few months ago, but it was first come first served and I got there third. I say this as a guy whose dream gun is a Thompson. I don't see the point of pistol caliber carbines anymore. Other than range toys or for optimized competitive games. I remember the 90s when an MP5 was the end all be all carbine until we remembered that an AR or AK could do everything it does better. And close quarters you probably still want a shotgun. 9mm? They could have made a legit rifle out of 10mm, .357, or .44. Enough to be a takedown hunting rifle with range. I just don't see it. Maybe I'm missing something. I don't think you are missing it, you have all the pieces above, perhaps just not weighted in the places I would. Lets start with the issues of pistol caliber long arms. You are right, rifle cartridges can do everything a PCC can do and better. Especially hunt and poke holes in people. However, I think the stroke of brilliance was to make it in 9mm, capable of taking one of the most ubiquitous pistol magazines and making it relatively low cost. The old Ruger Police Carbine was a Bill Rugerism that still couldn't see police using AR family rifles. This is a plinkster, which is why they didnt start in one of the .40 calibers or bigger. It is a little slow out of the starting gate since .22lr is back on the shelves, but bottom line is that 9mm is cheaper than all other (more powerful) pistol cartridges and nearly all centerfire rifle cartridges. Plinking for most US shooters is inside easy visual feedback range, you generally dont need a centerfire rifle for that. You don't need rifle steel. More and more outdoor ranges and even individuals are buying steel and rifle steel is much more spendy than pistol (by the way some pistol steel cant take high speed .44 Mag). There are probably nearly 100K members of IDPA and USPSA, so competition is also a valid market. The draw of the pistol caliber carbine is that you can shoot the exact same stages that you do for pistols, ARs would require you to at least change how the steel is utilized. As I said before, the reliable pistol caliber carbines offered right now tend to be expensive, so this as a modest priced one will be tempting. Defense and hunting is not a huge market. Those who want to use pistol calibers to pot animals already have lever action pistol caliber carbines and obviously pistols. Those who want to defend themselves with pistol caliber long arms already have the Beretta Storm. 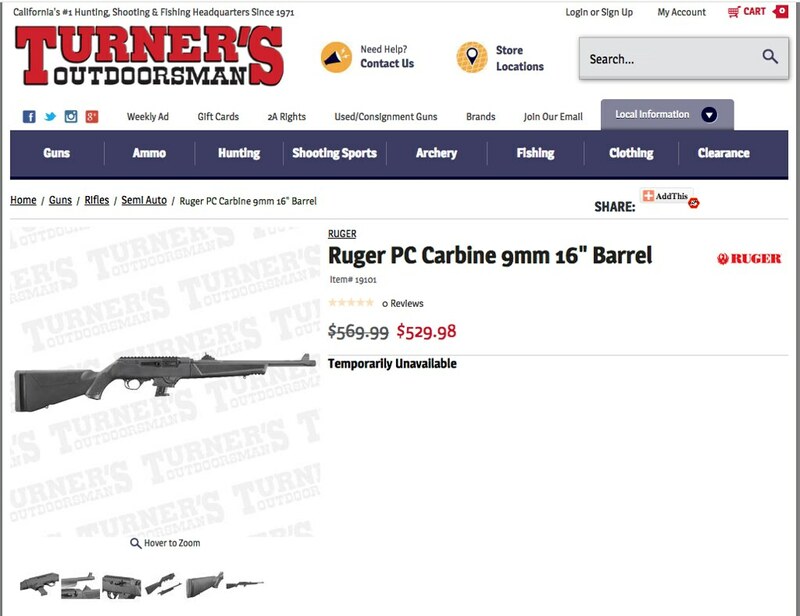 So it is probably smarter for Ruger to build the platform's market elsewhere first. They choose 9mm in that it is the cheapest round that cannot be dismissed for defensive application. They sell it as a plinkster, but keep it in a round that keeps their foot in the door for those that have pretensions of defense. This is something a .22lr has a hard time doing. I am thinking about the ammunition expenditures I have had in the last 15 years as a shooter. So an affordable plinking centerfire pistol caliber carbine may have a piece of market share. Anecdotally, pistol-forum.com, which tends toward a haven for serious students of the pistol and heavily tend toward Glocks normally scoff at PCCs for many of the reasons you mention. There was a lot of thoughful "hmmm" reactions when they heard that it takes Glock mags. None of this is to say that the economic viability will be there for the Ruger PCC. People have always liked the concept of the pistol caliber carbine more than it seemed to be sold and adopted. But considering the market right now, this is intriguing and seems to have a better shot than most recent attempts. Something more than a Kel_tec sub-2000 or Hi-Point, less than a high end pistol caliber AR. Bottom Line: Not for poking holes in living things, it is for cheap plinking that also cannot be discounted as a defensive gun. They could have made a legit rifle out of 10mm, .357, or .44. Enough to be a takedown hunting rifle with range. Ruger has made .44mag semiauto carbines, at least twice that I know of, one with a tube magazine, the other with a rotary mag like the 10/22. I've got my eye out for a used one, but they don't pop up often in my area. I'd love to see them bring it back along the lines of this new PC design. I can't shake the feeling that this space is ripe for some kind of super-modern mag fed takedown bullpup in magnum caliber that is "street legal" and fits in a backpack. At that point you can steal from the survival rifles, takedowns, PCCs, some shotguns, and even some of the scout rifle crowd. I know I'm on the fringe but I used to do R&D and it's the really weird problem solvers that tend to work. The big limit on such a gun is range, which I don't think matters. In the forests up here (and in the whole east) you just aren't shooting past 100 yards that often. I have the Ruger in 44 Mag and have to look at the mag well of end of the barrel to sort is from the number of 10-22's in the armory...they look very close and almost the same size..It is a powerful hog and deer hunter for the woods of Louisiana. I see more often on Gun Broker dot com. I have used 9MM in a carbine to take our local (smallish) deer and it is adequate for Zombies with the higher velocity of a carbine barrel. The thing that appeals to me is it is a take down model. I don't know why more manufactures don't make survival rifles and take down rifles. I have wanted a Kel-Tek sub 2000 for years but I can never find the model that I want. Also, I would like something like this in a 45 ACP. It seems that 45 is perfect for use with a suppressor as it is a big slow subsonic bullet. The price point is about right and the use of glock mags is also a big plus. And it takes glock mags so you know its gotta be good right? I have a different 9mm pistol round, semi-auto carbine. I absolutely love it. Feels like using a .22, but can be used for defense or close in hunting, or putting an injured animal here on the property down. And, I realy like having shared ammo between platforms -- I would LOVE it if mine used the same magazine as my semi-auto 9mm handgun, but it doesnt. It does use the same magazine as a popular handgun that was used at the same time, I just dont have that handgun. Mine is a camp 9 carbine, and it uses the same magazine as an old model SW 9mm handgun. Makes alot of sense to me that their new 9mm carbine would use the same magazine as a glock, sounds real handy. I should have said, "one of the only". The magazine fed 870 is innovative but I wouldn't buy anything the Freedom Group puts out, especially Remington with all the recent quality issues. Sig 320 is cool but not that innovative, another Glock copy. Glock gen 5 is hardly innovative. The "match grade" barrel is no more accurate than any other generation. Ill give you the Maxim 9. Truly a very innovative firearm. You also forgot Keltec. I could see an interesting possibility in a take down, integrally suppressed .45 ACP "Urban Rifle." The .45 ACP and its subsonic nature would help the suppressor. Even a stubby but not NFA (non-suppressed) semi-auto with a threaded barrel to accept the suppressor might be a good one. The bullpup could help here with the overall length, however you will pay for the shorter length with a cruddy trigger or a higher price to try to improve the trigger. Perhaps basic research can improve the cost to trigger quality ratio of bullpups, but they have been around a while and people have tried. .45 ACP is not the cheapest ammo on the planet for practice, but its better than the magnums and rifle calibers. The short range hunting world already has had the deerfield in semi-auto along with the ultra-heavy AR rounds (.450 SOCOM, .50 Beowulf, etc) and all the lever actions (.44, etc). Also, a few pistol caliber bolt rifles. So I am not sure the niche there being that large. Though, maybe the takedown nature would help. The .22lr ones like the 10/22 takedown and AR-7s sell just fine. I have a huge interest but small wallet this year. I already use the SR series in 9mm. I also see a G19 coming my way down the road. So I reload and stock 9mm. The PCC is appealing to me as a one size fits all like the cowboys. I have a 45ACP PCC which I like and have taken Deer with. I have to say I like it in the blind and got a 1 shot kill on a medium sized white tail at 35yards with no issue. I noted that it is so much quitter, lighter, and (with the takedown barrel on Ruger's new rifle) more transportable any other long gun in my safe. Full powder burn in the 20in barrel so should be no blast or reduced sound from the pistol. If the offer it in 45ACP then it may really be nice, since I also have an SR45. I bullpup PCC with an "ok" trigger would be interesting. This from the guy who is looking for someone to start making Grease guns because a Thomson is too pretty to use. Now that I think of it is not the Tavor available as a PCC? Thanks for the clarification. In that case I can see these Rugers selling very well in CA. I hope they go all the way and offer .40S&W, 10mm, and .45ACP. Hopefully the design is such that even if Ruger does not do this then third party mfgrs will offer caliber conversions. A 10mm with Buffalo Bore or similar loads would make a decent camp gun. I have helped others with AR15 mods for CA and they are not fun. The bullet button can stick unexpectedly, and the stocks are clumsy. If I was down there I would much rather have a solid PCC such as this (assuming it will be soon) and an M1A or Garand, rather than dork around with a modded AR15. Ironically (and much to the gun-grabber's fury, I'm sure), now that the pistol grip must be crippled, AR15's sold in CA no longer have stupid bullet buttons. Which is why I bought my first one last year, before the geniuses in Sacramento fully grasp just how modular the weapon they're trying to ban really is. To be clear, I'm not advocating violating the law, my Cali stocks stay on the gun, but if I travel to a different state, transforming it back into what everyone else is allowed to have is much easier than swapping out the damn bullet button. But, you're right, M1A's are my preference down here. In that case I can see these Rugers selling very well in CA. I had one of those...it was called MARLIN CAMP CARBINE and I had 9MM and 45 ACP versions. What did you think of them? Reliable? Just for fun or practical for home defense? I had fun with them (9MM and 45 ACP) for personal defence,either was very capable , I harvested many DEER and smaller game with either ,though gave an edge to the .45 ACP. I only found fault with the 'rubber' recoil bar at the back of the receiver as they would wear a bit with recoil,time,cleaning and lubricating oils and chemicals...I replaced them every 5,000 to 10,000 rounds to avoid little 'bits' getting into the recoil operated bolt and magazine and gumming up the works ( I found a hardwood dowel also worked well,though not as long lived) most springs and such were good for several hundred thousand rounds. With modern ammo,either is plenty capable for any game here in the South. I should not have sold them to my cousin for $350 for BOTH ,but he is family and I have many more to take their place and he is enjoying the butter smooth actions that you only get from such high mileage weapons. I still have the camp 9. And, that recoil block , the original, will break down from age in storage, left a bunch of "cookie crumbs" in it. The repalcements are blue and a different material, supposed to last better in storage, I have a spare now too. My guns were 'rental' guns that I let people use on the range for cost of ammo,this is how I know a Glock 17 will not wears out the barrel with in excess of a million rounds though it needed springs replaced every 150,000 rounds or when they broke...well beyond the 1500 rounds suggested for 'duty' guns. Yeah, I'm not crying for someone with a BAR, my friend! The Marlins are merchandise but some like the BAR are legends and history. I was just getting one of my Garands ready for the next range trip and admiring the pure classic utility and beauty of a WWII weapon. Anyway, you got me thinking about a Ruger Carbine now. Sounds useful and fun. That cetinly speks well for the MAArlin's and Glocks durability. I wonder why the Camp carbines were discontinued? Was it about the same time the AR15 was becoming popular (mostly after the AWB)?